I've been told never to start a letter with an apology; it's not proper correspondence etiquette. But they didn't say anything about blogging. So here it is: I'm sorry. I'm sorry for the giant gap between posts recently. Stricken with a doozy of a stomach bug, I was laid out for two weeks straight earlier this month; even the third week wasn't so hot, to tell the truth. Not just because I couldn't eat or drink, I couldn't have any WINE. For THREE WEEKS. Even ON MY BIRTHDAY. But I'm all better now. And trying to catch up. Tyler Harlton 2012 Viognier Pinot Gris (Summerland, BC) - This was a surprise purchase I made in Penticton during the bloggers' conference. 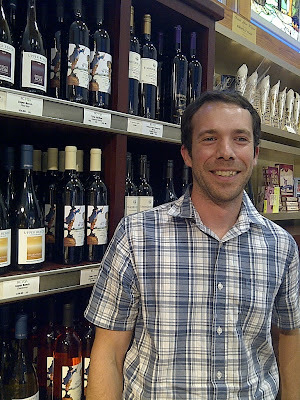 While power-shopping at the Penticton VQA store between sessions, I met William "Bill" Adams, part-time liquor store product consultant and rest-of-the-time winemaker at Tyler Harlton Wines. 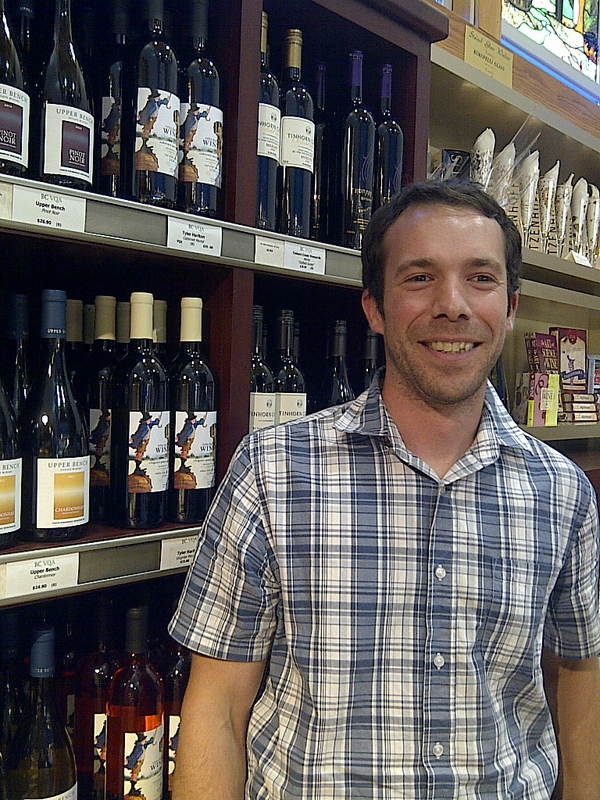 Bill's been making wines with Tyler since the duo first opened up shop in 2011. They make small batches of viognier, pinot gris & noir, cab merlot, cab franc and an apple wine. He held up this particular bottle as his top choice, an unlikely pairing aged in neutral barrels (used ones leftover from other wineries; Bill likes them because, once torched, the grain of the wood tightens up and doesn't impact the flavour of the wine as much.) Up front, a subtle soapy/glycerine scent alluding to the viscous texture of the wine, along with pleasant cantaloupe/honeydew melon, cut lawn and fresh florals. Mid-weight with a firm backbone of acidity, but predominantly "oily" (in a good way!) Loads of tropical fruit, lychee, baking spice and citrus zest on the palate, with a luxurious, stay-awhile finish. There is no doubt that I will be doing a bit of cross-border shopping again sometime soon. 20 Bees 2012 Pinot Grigio (Niagara-on-the-Lake, Ontario; sample supplied by Diamond Estates) - Panel-tasted with my in-house 'focus group' of thirsty visitors. Aromas ranged from fragrant floral/orange blossom to citrus zest; palate showed high viscosity balanced with a sharp streak of acid bordering on bitter. The slippery mouth feel was enjoyed by few; perhaps a bit too oily for this pinot grigio. Overall, well received as a decent sipper for summer. I got together with Nita, Holly and Eva for a day trip to Domaine Perrault (Navan, Ontario) in late July. Lots of great stuff there, particularly the Marilys rosé, a top-notch blush that goes extraordinarily well with everything. Their 2011 Pinot Grigio (made with Niagara fruit) is heavy on the stone, flint and pencil shavings, with a pithy/grapefruit note to it and a long, zesty finish. The 2011 Rosalie (St. Croix/Sabrevoix, grown on-site) was an amazing find, setting itself up to be the perfect pizza wine with hints of basil and oregano on the nose and palate, rounded out with black cherry, mint and peppercorn. It had this distinct, tomato-sauce-iness and grippy acid/tannin balance that I fell for, hard. Sommelier and hostess-with-the-mostess Julie Rivard, ever-friendly, knowledgable and kewl, guided us through the full tasting and even set us up on the patio outdoors to enjoy the afternoon. J. Lohr 2010 Seven Oaks Cabernet Sauvignon (Paso Robles, California) - I wasn't sure whether I should drink this or dip my pen nib in it, it was so inky-black-purple and completely opaque. Redolent with plums, figs, dark chocolate and roasted meat, with a delicious blend of pepper, violets, blueberries and blackberries on the follow-through. Medium-to-full bodied, outstanding balance and a tight tannic finish that left a bit of fur on my teeth. This is a big, brawny cab that requires some heavy-duty grilled meats to go with it. Our family vacation this year took us to La Malbaie, Quebec, just an hour shy of where the Saguenay and St. Lawrence rivers meet in a wild swell of currents. While there, I was treated to a Pascal Jolivet 2012 Sancerre (Loire, France), which can only be described as bordering on ethereal. Maybe it was the perfect weather, the luxurious setting, or the fact that I was being pampered by lovely people determined to ensure I stayed in a most blissful, zen-like state of happiness. But that wine was spectacular. Delicate floral notes, muted citrus and a flitting zestiness that pranced across the palace. Every element was in faultless balance with the other. It's one of those "somewhereness" wines that, when I taste it again, I will immediately remember sun-drenched afternoons by the pool, dressing up for dinner, and long, hilly roads through la belle province.